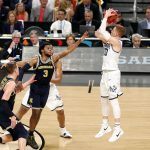 The Final Four odds favor the Villanova Wildcats winning their second National Championship in three years, but fans and sports bettors alike have plenty of faith in the other remaining teams headed to San Antonio. Next Saturday, Villanova will play Kansas, the other remaining No. 1 seed, in a semifinal game that will perhaps to some feel like the quasi-championship. The Jayhawks survived Duke in overtime on Sunday 85-81 to book their ticket to the Final Four. The Wildcats had an easier go of it in their Elite Eight matchup after taking control in the second half against West Virginia. Villanova won 90-78. Before ‘Nova and Kansas tip off, one team will already have secured their spot in the National Championship. Not many outside Michigan had the No. 3 Wolverines making the Final Four, but only the most faithful devout follower of No. 11 Loyola Chicago had the Ramblers still playing in late March. As for the early Final Four odds, the Westgate SuperBook opened lines with Michigan spotting Loyola Chicago five points, and the over/under at 128. Villanova is a 5.5-point favorite over Kansas, in what oddsmakers believe will be a higher scoring game (156 over/under). Two of the four remaining March Madness teams are universities with deep religious roots. Villanova is the oldest Catholic university in Pennsylvania (1842), and is named after Saint Thomas of Villanova. Loyola Chicago is also affiliated with the Catholic church, and was founded in 1870 by the Jesuits. Both teams will be praying to have divinity on their side this Saturday. 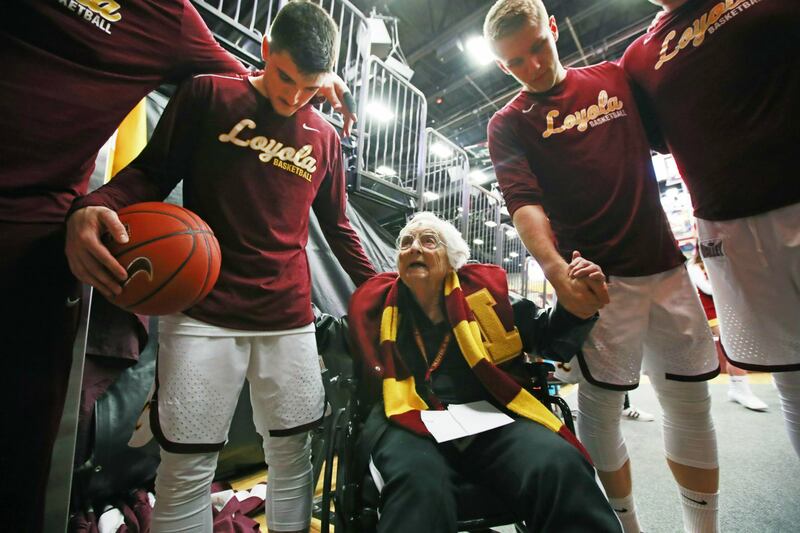 Loyola will have its spiritual leader, Sister Jean Dolores-Schmidt, courtside. The 98-year-old nun is the team’s chaplain and provides spiritual guidance to the players. She remembers Loyola Chicago’s 1963 NCAA National Championship fondly, as she was a young 43 at the time. The Ramblers collectively won their first three March Madness games by a total of just four points. Their Elite Eight win was much easier on the nerves, as they took care of Kansas State 78-62. The 68-team bracket is down to just four, and oddsmakers like ‘Nova. The Wildcats are even money to cut down the nets in San Antonio on Monday, April 2. Villanova is trailed by Michigan at 5/2, followed by Kansas 3/1, and Loyola Chicago remaining the underdog at 12/1. William Hills told ESPN that it took 32 bets on Loyola Chicago to win it all prior to the start of the tournament. The largest was a $150 wager that would net $45,000. The 300/1 pre-tourney title odds on the Ramblers implied a 0.33 percent chance of winning the title. Just a $10 bet would win the fortunate gambler $3,000.